Here at Toolkit Websites we web site designers sometimes like to let our hair down a bit. 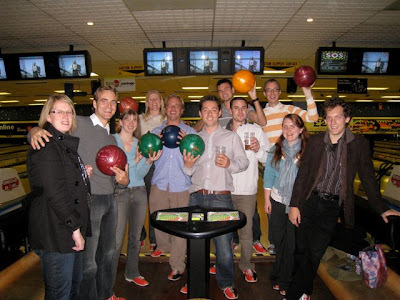 We recently had a company social to welcome Alex, the newest member of our web design team, to the company and which included a trip to 10 Pin Bowling in Millbrook, Southampton. Richard, our website design project manager, managed to get the lowest score but bowled the fastest bowl of the night! How does that work? Alex, also managed to score a strike with one of the slowest bowls. After that we went to dinner at our favourite restaurant Coco Rio and for a drink at the Orange Rooms. Our office is in the Bedford Place area of Southampton which is really vibrant in the evenings.